You don’t need to be embarrassed by your stained and discoloured teeth anymore! A brighter, whiter smile is easily attainable through one of the most popular dental treatments currently available: Tooth Whitening. This remarkable treatment is one of many offered at Start Smiling to bring out the very best of your smile in a straightforward, safe, and above all, effective manner. Our teeth are subject to all kinds of punishment over the course of our lifetime, as many foods and drinks can cause a progressive staining and discolouring of our smile. Common culprits include red wine, smoking, and coffee. Through Start Smiling’s teeth whitening treatments you can restore your smile to the level of whiteness and brilliance you desire. The home whitening treatment on offer typically takes about a fortnight to achieve its effects, and the widespread popularity of this treatment is testament to the quality of the results it can offer you. Q. How do I know if tooth whitening is for me? A. If your teeth have suffered a gradual loss in their whiteness and sheen, or if you are simply unhappy with the colour and shade of your smile, then tooth whitening is likely the right choice for you. 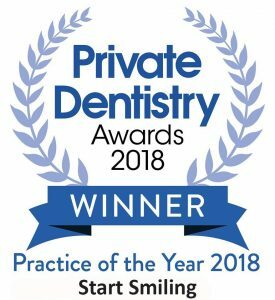 This treatment is particularly safe and effective, so it is likely that you will be suitable for it, but the only way to make sure is to arrange a consultation with our dentist who can assess your teeth and your goals and tell you how best to achieve them. Q. Can whitening my teeth make them more sensitive? A. Sometimes a whitening treatment can leave your teeth more sensitive, but rest assured that this side effect is most often a temporary one which will resolve upon the end of your treatment (so typically at the end of the 2-week period typical of the treatment). With this in mind, many tooth whitening agents are made with ingredients like fluoride and potassium nitrate which desensitise your teeth and improve the comfort of the treatment. Q. How do tooth whitening treatments work? A. Tooth whitening agents target the elements of your teeth which have become discoloured over time. Discolouration occurs as your teeth gradually accumulate molecules which confer the darker colour, and by breaking these down the natural shine of your teeth will be restored. Q. Can tooth whitening make my teeth weaker? A. Two of the key ingredients contained within tooth whitening agents are fluoride and potassium nitrate, these are components which not only reduce the sensitivity, a common side effect of tooth whitening, but also strengthen enamel and reduce tooth decay. Q. How long can I expect my whiter smile to last? A. Fortunately tooth whitening is quite a long-lasting treatment because of how the whitening process works. By targeting the molecules within your teeth which confer a darker colour, your teeth are provided with a long lasting whiteness which will at most need the occasional touch up. It is difficult to say exactly how long the treatment will last as there are many factors which can affect your teeth, these include your age, genes, certain medications, diet, and the consumption of food and drink which discolour teeth. By avoiding drinks such as red wine and black coffee, and bad habits like smoking, you can preserve your whiter smile for much longer. If you’d like to know more about teeth whitening, or see if you’re suitable, please pop your details into the form below for a Free Smile Analysis.